At one point my research concerned the location of targets in three-dimensional space. For countless World War II anti-aircraft crews, finding an incoming bomber at night or under overcast conditions proved particularly tricky. 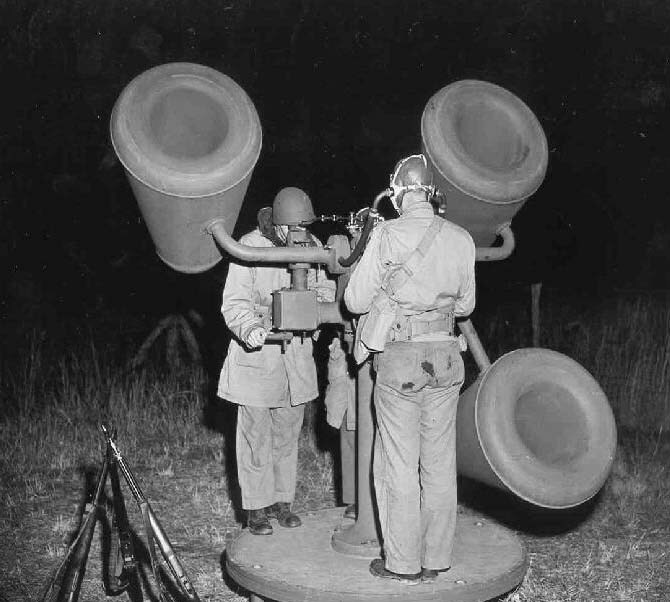 A website produced by veterans of the 255th AAA Searchlight Batallion contains a pretty interesting sidebar about how listening devices were used to train both searchlights and anti-aircraft cannons at enemy aircraft. What is interesting about these pictures is that the sound device operator is literally attached to the machine -- it is as if he has a huge, external ear attached to his head. As it turns out, the "listener" would use the listening device to locate approaching aircraft and direct searchlight and anti-aircraft batteries towards their flightpath. Later, the system became more automated -- the listening device would "point" searchlights and ack-ack. And eventually, the listening device was replaced with either a short- or long-range microwave radar array, ensuring that the only human element would be the gunners who loaded ordnance or pulled lanyards on the anti-aircraft cannons. Such devices are the subject of David Mindell's majestic Between Human and Machine : Feedback, Control, and Computing before Cybernetics (Johns Hopkins, 2002). The book provides a thorough pre-history of cybernetics, describing a whole slew of control systems that utilized many of the principles of feedback, oscillation, and control even before Norbert Wiener wrote Cybernetics: or the Control and Communication in the Animal and the Machine (1948). Along with other World War II-era devices, such as the Anti-Aircraft Predictor and Norden Bombsight, one wonders what effect these devices had on postwar visual culture. If you think about it, these systems replace sound and vision with a fully-automated (and wholly bureaucratized) version of seeing and hearing.